Making a purchase could not be easier. Simply browse our store and add the items required to the shopping cart. To complete your order, click on the 'View Basket' button at the top right of the screen and click on 'Checkout Now'. Enter the requested address and billing details, select delivery option, and click 'Confirm Order' to submit. Can I order over the phone/via email? Of course. We are happy to take your order over the phone or via email. Please call 02380 335 744 or email and a member of our sales team will be happy to help. Unfortunately we are unable to offer the web prices over the phone/via email. Orders processed through our online shop can be shipped to UK Mainland only. We can process other non-UK Mainland orders via our sales team, so please call them on 02380 335 744 or email . All online orders are sent via TNT, as our default courier. We use their express service, which is next day delivery across mainland UK (excluding Highlands, Islands and parts of Wales and Cornwall. Please see map below for more information). You will be supplied with a consignment number on despatch of your goods, so you can track the progress of your delivery. 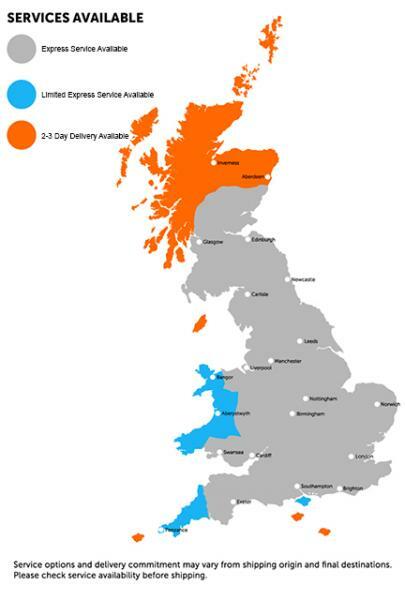 This applies to deliveries to the UK mainland only (excluding Highlands, Islands and Cornwall). We despatch via courier each working day (Monday - Friday), excluding Bank Holidays and the Christmas break. Where we have the items in stock, we aim to despatch your order on the day it is received, on a standard next day delivery service. On items that require manufacturing and testing, please do allow extra time as your order will need to be scheduled into production. During our busiest periods (April - July), please allow a few days for delivery and do advise us of any critical delivery deadlines. Is there an order cut-off time for next day deliveries? Our cut-off time to accept orders for next day delivery is 12pm (Monday-Friday). Yes, you can specify a preferred delivery date in the Additional Notes form at the checkout. Will I need to be in to sign for my delivery? As standard, courier deliveries will require a signature. However, if you are unable to be present when goods are delivered, please let us know and we can authorise the courier to leave your delivery in a safe place, without a signature. Please also advise of a safe place where the goods may be left in your absence. Although we endeavour to despatch products to get to you next day, there will be rare occurances where products might be delayed. Please notify us within 14 days of your delivery date and we will do our best to look into it for you. We accept Visa, Mastercard, and Visa Debit cards online via Sage Pay. If an item is available to purchase on the website, does this guarantee it is kept in stock? Although we strive to keep maximum stock levels of most standard products, there are occasions where an item(s) may be out of stock. We will always advise the customer of stock availability on receipt of an order, and advise of estimated delivery date. If an item on your order is out of stock, we will place this on back order for you and advise of expected delivery date, giving you the option to cancel your order if you require the item urgently. Where we have partial stock, we will always try and despatch what we have available and send on the remainder when back in stock. Please do indicate when placing your order if there are critical delivery deadline dates. Where do i need to send my returns to?